Life-saving research from the University of Liverpool into rotavirus, the leading cause of severe childhood diarrhoea, is today being celebrated as one of the UK’s 100 best breakthroughs for its transformational impact on child health across the world. 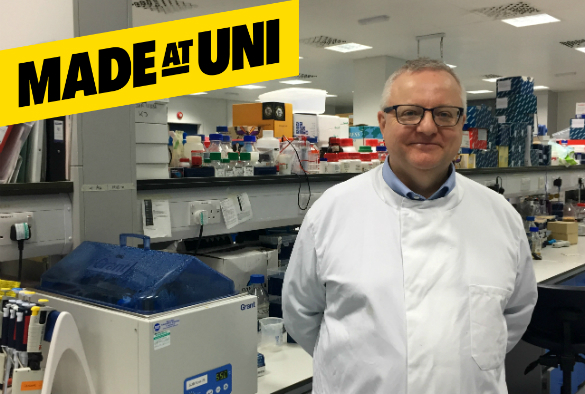 Work led by Professor Nigel Cunliffe at the Institute of Infection and Global Health has played a key role in the introduction and evaluation of a vaccine for the highly infectious stomach bug, which kills around 200,000 infants and children each year and hospitalises many more. The UK’s Best Breakthroughs list demonstrates how UK universities are at the forefront of some of the world’s most important discoveries, innovations and social initiatives. It was compiled by Universities UK as part of the MadeAtUni campaign to change public perceptions of universities and bring to life the difference they make to people, lives and communities across the UK. For the past 20 years, Professor Cunliffe has directed a long-term programme of rotavirus research in children in Malawi. This included a pivotal first clinical trial of a human rotavirus vaccine in Africa, which informed a global vaccine recommendation by the World Health Organisation in 2009 and the subsequent introduction of rotavirus vaccine into Malawi’s childhood immunisation schedule in 2012. The UK followed in 2013, and rotavirus vaccine is now part of the vaccination schedule in 96 countries around the world. A recent evaluation of the impact of rotavirus vaccine in Malawi showed that it has reduced infant diarrhoea deaths by nearly one-third. In Merseyside, gastrointestinal illness has fallen markedly since rotavirus vaccine introduction, with the greatest impact seen in the most deprived communities. Professor Cunliffe said: “I’m absolutely delighted that our rotavirus work has been chosen as one of the UK’s top research breakthroughs. It’s all down to the incredible team effort of colleagues here in Liverpool with our collaborators and partners from Malawi and across the globe. Professor Dame Janet Beer, vice-chancellor of the University and president of Universities UK said: “Universities really do transform lives. The technology we use every day, the medicines that save lives, the teachers who inspire – all come from UK universities and the important work being done by academics. As part of the MadeAtUni campaign, every university in the country was invited to nominate the one thing from their institution which they believe has had the biggest impact on people, lives or communities. Over 100 universities submitted a nomination. The entries cover health, technology, environment, family, community, and culture and sport. Maximising the Regional and Global Impact of Rotavirus Vaccination.